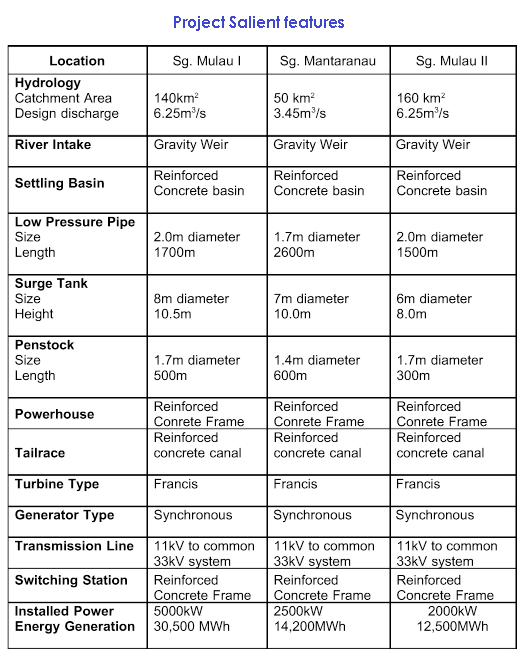 I was looking for information on how to develop a low-head micro hydro generator and found this proposed 9.5 MW Mini Hydropower plant in the District of Tuaran, on Scribd. It is very interesting as the river (Sungai Tuaran/Kiulu) has been talked about as a suitable area for developing mini hydropower for sometime now. The salient features of the project is summarised in the following table. This working paper was written few years back by Afiepower Sdn Bhd and coffeeshop talk among the population at the affected area has it that the approval for the hydro-power scheme has been given although no confirmation of this from any government agencies or the local authority yet. No diagrams and detailed construction dimensions as these were not uploaded to Scribd by the document uploader. Hope this is an interesting read for many. i think the public shouldn't object to this. The project looks like a venture capital, whereby the developer become the financier, owner & operator. No single cent from the govt. or SESB. Problem is, the developer/owner didn't start on a good note; no proper PR with the affected residents was done and they felt that some interested quarters are trying to bulldoze this project without taking into account their interest. Don't get me wrong, I'm all for development. Just need it to be done in a transparent, responsible and inclusive manner. Never heard of this until now. Though I live in Tamparuli.. (Truli).. Thanks for the info.